Anxiety has always been a part of my life and for most of it, I was able to manage my anxiety and keep living my life. But something happened right around the time I got married that made my anxiety spiral out of control. This was when I realized that I couldn’t manage it on my own anymore. So, I started seeing a therapist. That was my first step. By following the next steps that I am about to share with you, I have been able to conquer my anxiety and take my life back. And I truly believe that if you do this, you can take yours back too. For the longest time, I hid my anxiety behind a mask of confidence and happiness to the point where no one even knew the lengths to which I was struggling. Have you been there? It was so hard to explain that my anxiety didn’t make me any less confident or happy. It just made me terrified and somewhat insecure. I chose to seek professional help because I didn’t want my friends, family, and especially not my husband to feel like they needed to fix me or look at me like I was broken. I wanted to still feel “normal” even though I had this monster inside of me trying to steal my joy. 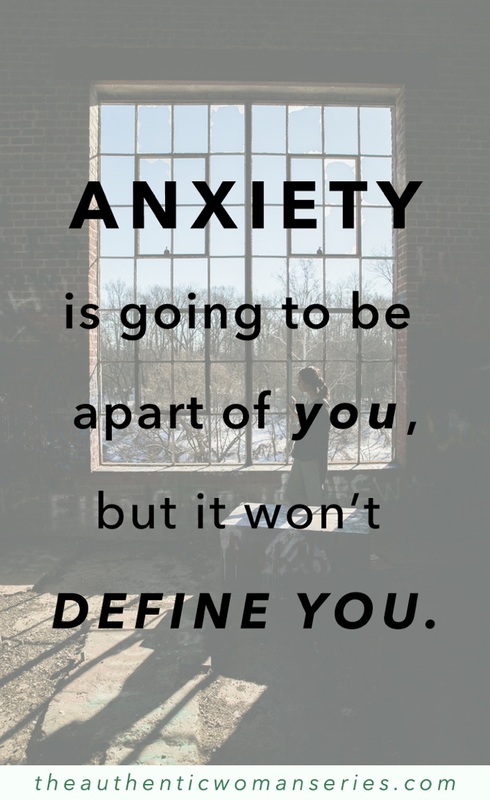 When I started my counseling sessions, I discovered that my anxiety was going to be a part of me, but it wasn’t going to define me. I also discovered that I wasn’t “weird” or “broken” for having anxiety and that it was largely due to how I was physically and mentally training my body to respond to certain events or situations. That’s when things started to change. Physical activity is so important for total body health. We’ve all heard how important it is to get out and get active, but did you know that these practices strongly affect your mental state as well? Sometimes it can be so hard to find the motivation to get out and move when we’re stuck in a rut. But it is SO important. If your body feels good, your mind feels good. Exercise produces endorphins, which are chemicals in the brain that act as a natural painkiller. Simply exercising for five minutes a day can begin to stimulate anti-anxiety effects. If you can combine exercise with sunlight (like a quick walk around the block), you’ll start to decrease effects of anxiety. One of the causes of anxiety is a deficiency in vitamin D, which we naturally get from sunlight. There’s a reason why so many people feel genuinely happier in the summertime than in the winter. It’s because they’re generally more active, and spending more time outside. So much of what we consume in our foods may actually be increasing our anxiety. I recently read a book called the Anti Anxiety Food Solution by Trudy Scott, and I learned so much about how what I was choosing to nourish my body with was actually hurting it more than helping. My body is a temple, and I was taking very poor care of it. Some of the biggest offenders are caffeine (caffeinated coffee and sodas were a huge part of my life), sugars, gluten, dairy, processed foods, and alcohol. Over the last several weeks, I’ve been making an effort to cut out most of these foods and some of the food groups entirely. Some have definitely been easier than others, but overall, I have noticed a significant difference in my mood, energy, and anxiety levels. I wouldn’t be suggesting this to you if I hadn’t tried it myself and seen such incredible changes. For just about every issue you have, there is a medication to adjust it. What you may not know, is that there are natural ways to adjust these issues as well. In my journey with overcoming anxiety I have so far been able to cut out 3 of my 5 medications and am currently working toward cutting out the final 2. What do I mean by this? Well, the products we often use on our skin affect what is being transferred topically into your blood-stream, and this can affect what’s being sent directly to your brain. There are a lot of toxic ingredients in the products we use every day, and this can also increase your anxiety. I downloaded the free app called Think Dirty. On this app, you can scan products to see whether or not the ingredients used will be harmful to your body. The lower the rating, the better it is. Since using this app I have changed my entire collection of skincare and makeup products, my detergents, fabric softeners and what I use to make my home smell nice. Over the past couple of months, I have been adamant about implementing all 4 of these steps. They’ve drastically changed my mood. I feel much calmer, happier, and more adventurous than I have in a long time. I didn’t let my anxiety win the war. I made it my mission to minimize the effects of anxiety using these steps, and it has been working. I know that if you are serious enough about taking your life back, it will work for you too! Caylee Connelly is a lifestyle blogger for Coffee Talk with Caylee. Most of her content revolves around general life issues & discussions, navigating through marriage, faith, friendships, and all the hard stuff.